We will survey the job, advise you and provide a quote for the work - no obligation! 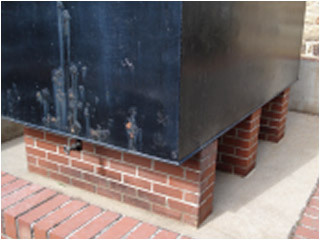 With our specialist experience in this field, REST ASSURED we WILL solve your problem. 1100 litres of heating oil leaked out of the bund onto the tarmac drive after thieves stole the outlet copper pipe. 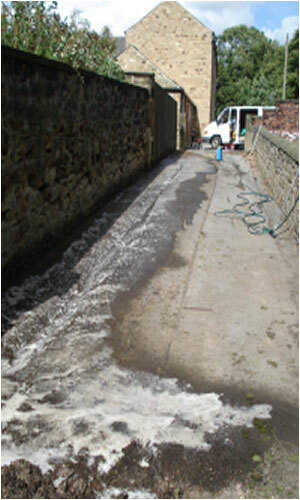 The images show the concrete bund just after cleaning (below) and the driveway during the cleaning process (right). We use enzyme (bacteria) based products to digest and neutralise the harmful hydrocarbons, and these bio remediation products have been tested by the UK Environment Agency and found to contain NO harmful or toxic by-products. Bio remediation of oil contaminated land can also be undertaken.